Go where no aerial apparatus has gone before. Without compromising on water capacity, performance, or safety. 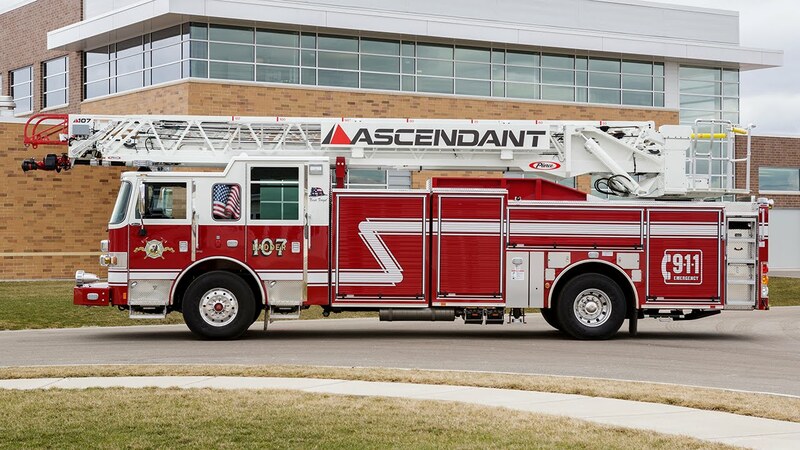 The Ascendant 107' heavy-duty steel ladder has truly redefined the single rear axle aerial market, providing firefighters with an unprecedented 107' of vertical and 100' of horizontal reach without compromising on water capacity, performance, or safety. The heavy-duty 100,000 psi high strength steel ladder was purpose built using proven engineering practices. The Ascendant is rated at a 750 lb dry and a 500 lb wet tip load capacity with an additional 100 lb equipment allowance. It can flow up to 1,500 gpm and is capable of a store front blitz feature as standard. The Ascendant is designed to be operated at a 12 percent uphill slope and a 9 percent downhill slope. As standard, the frame rails, torque box, and pedestal are e-coated for improved corrosion resistance. The design, strength, and durability of the Ascendant ladder have been rigorously tested. Using a third-party, every Pierce aerial is certified to the stringent UL Type I requirements. 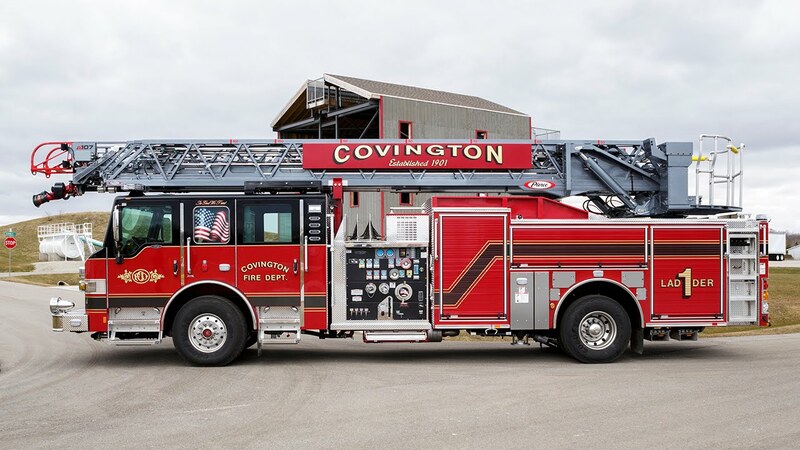 The 107' Ascendant heavy-duty ladder is available on a wide range of body styles, providing firefighters flexibility and a wide range of options to meet each department’s needs. The Ascendant is available with a quint body style, a Texas Chute Out style body for departments desiring a side stacked hosebed, and a true truck company body style with no pump or tank. Compartment space varies, ranging from 144 cubic feet to 306 cubic feet depending upon the body style selected. 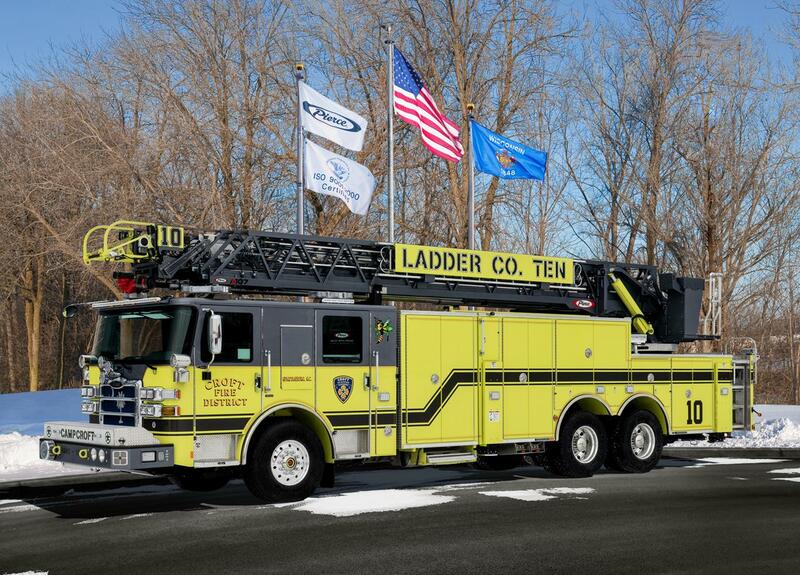 In total, with water and foam, the 107’ Ascendant on a 33,500 lb single rear axle can accommodate an impressive 500 gallons with 2,500 lb of equipment, full hose complement, and a big block engine (if desired). The Ascendant ladder is not a new ladder structural design at all; it’s simply an optimized design structure. 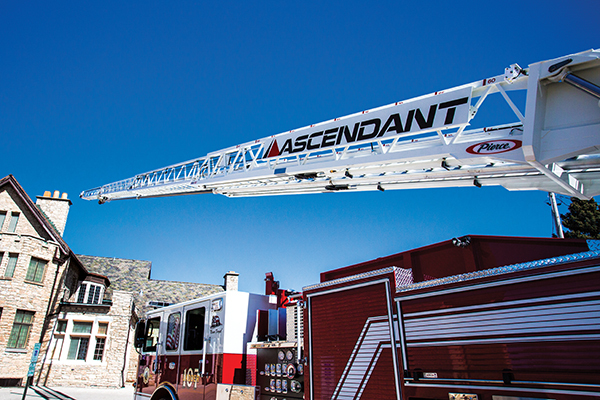 The Ascendant ladder can flow up to 1,500 gallons per minute and is capable of a store front blitz feature as standard. The Ascendant ladder is rated at a 750 lb dry and a 500 lb wet tip load capacity with an additional 100 lb equipment allowance. Compartment space varies, ranging from 144 cubic feet to 306 cubic feet depending upon the body style selected. In total, with water and foam, the 107' Ascendant on a 33,500 lb single rear axle can accommodate an impressive 500 gallons with 2,500 lb of equipment, full hose complement, and a big block engine (if desired). 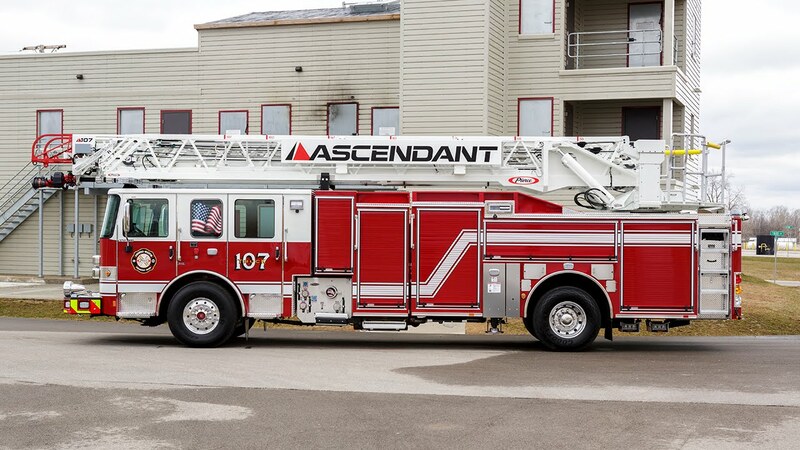 The Ascendant 107' heavy-duty steel ladder has truly redefined the single rear axle aerial market, providing firefighters with an unprecedented 107' of vertical height and 100' of horizontal reach without compromising on water capacity, performance, or safety. E-coated pedestal, torque box & frame rails on the single rear axle. E-coated torque box & stabilizers on the tandem rear axle configuration. The optimized design of the Ascendant ladder results in a significantly lighter vehicle – with a rear axle rating of only 44,000 lb. Departments in weight restrictive states can now have an Ascendant tandem axle configuration in their fleet. Costs of ownership are lower with less brake and tire wear. Stopping distances are shorter and departments will realize better performance from the chassis drivetrain. The Ascendant platform has a remarkable operational range of -10⁰ below ground level to 77⁰ above ground level. The clean aerial tip design incorporates an easily replaceable egress. The pedestal & torque box design is the backbone of the Ascendant single rear axle ladder. The unique design allows for no compromise in the ladder performance. Featuring 1 set of H-style stabilizers and 1 downrigger, the stabilizers were moved to locations on the apparatus to maintain stability on a single axle with the weight available. On the Ascendant tandem axle configuration there are four stabilizers, but only the front stabilizers are H-style outriggers – the rear two stabilizers are downriggers that reduce the set-up footprint. The Ascendant platform is designed to perform at full capacity on a 9% downhill slope while meeting all NFPA stability requirements. The Ascendant platform is designed to perform at full capacity on a 12% uphill slope while meeting all NFPA stability requirements. The patented Ascendant technologies make it easier to setup and position the apparatus, and provide smoother and quicker ladder deployment speed. Sales Organization: Spartan Fire & Emergency Apparatus, Inc.
© 2019 Pierce Manufacturing, Inc.